The 30.5 mm selector switches features a zinc die cast construction with chrome-plated housing and mounting nut. The contact blocks feature enclosed silver contacts with pointed "reliability nibs" for reliable performance from logic level up to 600V. To ensure reliable switching, nibs bite through oxide which can form on silver contacts, eliminating the need for expensive logic level blocks for most applications. Reliability nibs improve performance in dry circuit, corrosive, fine dust and other contaminated atmospheres. Under normal environmental conditions, the minimum operational voltage is 5V and the minimum operational current is 1 mA, AC/DC. For operation under a wider range of environmental conditions, logic level contact blocks with inert palladium tipped contacts are recommended. 10250T-SS Series operators have grounding nibs4 metal points on the operator casting designed to bite through most paints and other coatings on metal panels to enhance the ground connection when the operator is securely tightened. 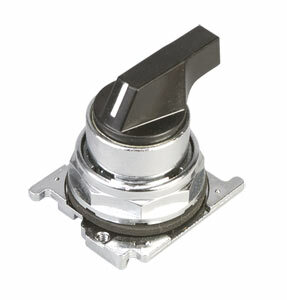 Omega’s selector switch operators offer front of panel drainage via holes in the operator bushing. Hidden from view by the mounting nut, these holes prevent buildup of liquid inside the operator, which can prevent operation in freezing environments. The holes also provide a route for escaping liquid in high pressure washdowns, effectively relieving pressure from the internal diaphragm seal. This ensures reliable sealing in applications even beyond NEMA 4. Note: *Operators require contact blocks, sold separately.